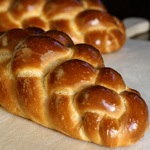 The fendu can be made with any shapeable dough, but my understanding is that it is traditionally done with country French bread (pain de campagne), which is a basic French bread, made with sourdough or other preferment and a portion of whole grain flour (rye and/or whole wheat). 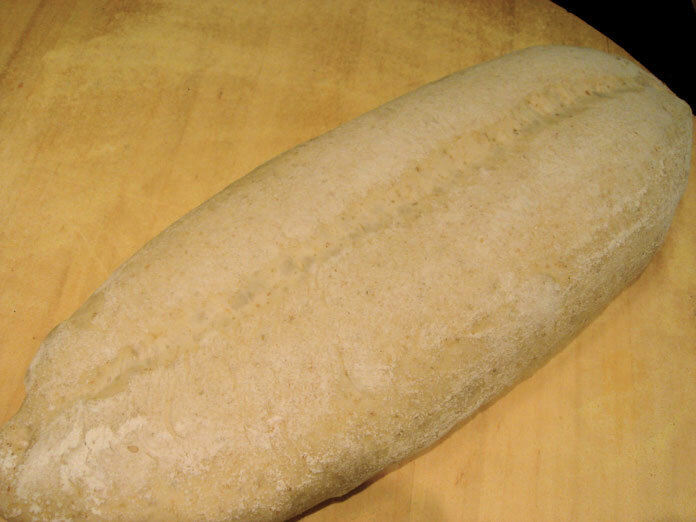 To shape the fendu, first shape a batard. Make it a bit stubby; it will elongate into a torpedo as you complete the shaping process. Place the batard on a lightly floured counter, and sprinkle a little flour on the top. With a dowel (or, if you can’t find one, a new (undented) drumstick, like the one I borrowed here), press into the center of the loaf the loaf firmly along the long axis. Roll the dowel back and forth to make a “hinge” about two inches wide and 1/8-inch thick. Sprinkle the hinge very lightly with flour. 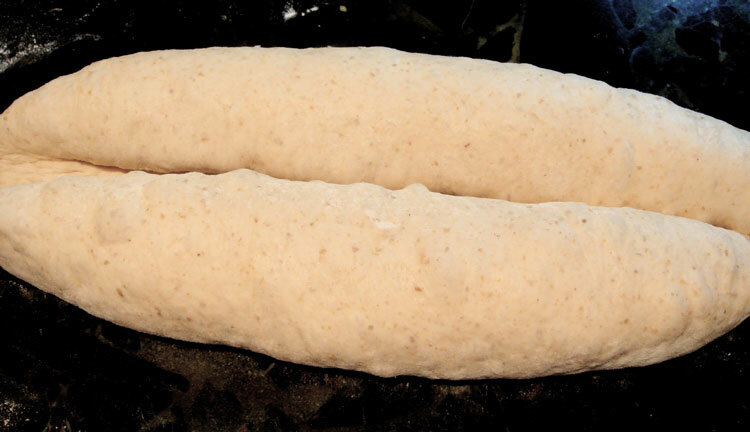 Roll the two halves of the loaf back toward each other so they touch. 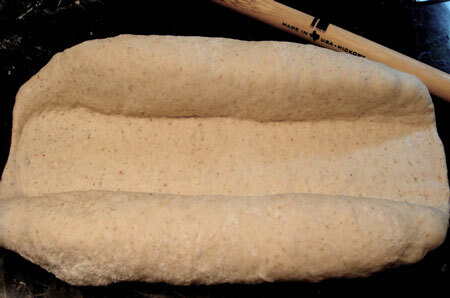 Place the loaf, split side down, in a floured couche or linen-lined banneton to proof. After proofing, the split may look rather indistinct, but it should open up during baking. Bake the loaves split side up, and voilà! Now, about the dough. My plan was to do a variation on Norwich Sourdough, substituting whole wheat flour for half of the pumpernickel. Then I realized I had to be somewhere before the bread would be done, so I planned to spike the dough with a little yeast (3/8 t.) for faster fermentation. Then I realized I had elaborated my starter into only about half of what I needed, so I doubled my original amount of yeast and increased the flour and water to make up for the missing starter. So it’s not the dough I would usually make, but the bread was done in 4 1/2 hours from start to finish, the crust was a whole lot more crispy-crackly than what I usually get using a higher proportion of starter, and the taste still beats most store-bought bread by a mile. Let the dough rest (autolyse) for 20 minutes. Add the salt and yeast and continue mixing on low or medium speed until the dough reaches a medium level of gluten development. This should only take about 3 or 4 minutes. Ferment at room temperature (72F – 76F) for 1.5 hours, with folds at 30 and 60 minutes. Turn the dough out onto a lightly floured counter. Divide it into two pieces and preshape them into light balls. 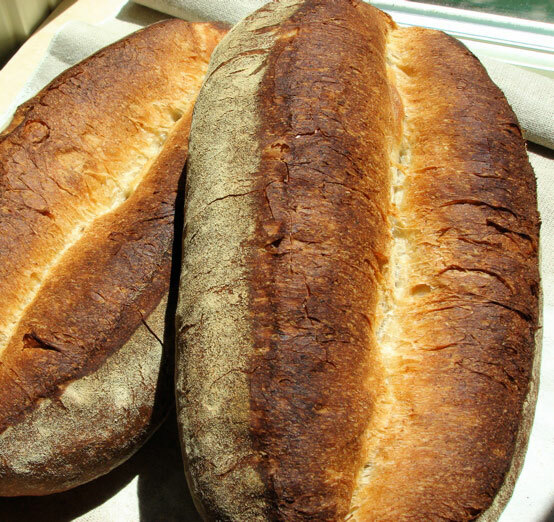 Shape into fendu batards and place split side down in a floured couche or linen-lined bannetons. Slip the couche or bannetons into a large plastic bag or cover with plastic wrap and proof at room temperature for 1 – 1.5 hours. Turn the proofed loaves, split side up, onto a semolina-sprinkled peel or parchment. Once the loaves are in the oven, turn the heat down to 450F. 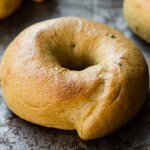 Bake for 10 minutes with steam, and another 20 minutes without steam. The crust should be a deep brown. For a very crisp crust, turn off the oven and leave the loaves in for another 5 minutes with the door ajar. Susan, you do beautiful work all right. You make the fendu sound and look so easy.. what about all the trauma and angst re trying to keep the hinge open? Apparently not an issue in your world. I had been feeling a little reluctant to try it but this certainly is what I call encouragement. I’m interested to hear what you say about crust difference in the spiked vs straight sourdough. Is this typical for you? Browndog: uh-oh, it certainly wasn’t my intention to provoke trauma and angst! 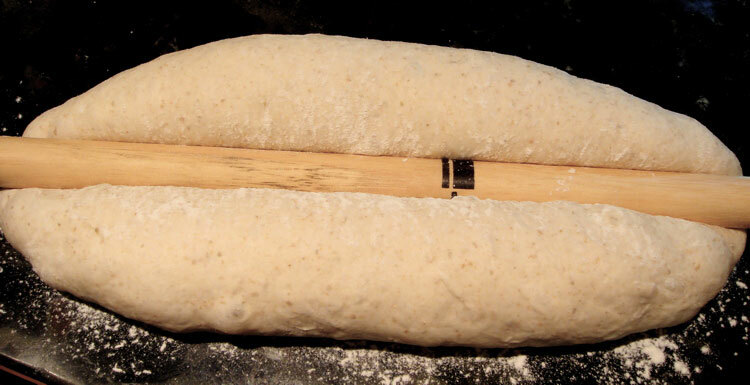 I guess with a really elastic dough it could be challenging, but you could roll it a little wider than you need to allow it to spring back some, and you really only need it to stay open long enough to roll the halves together. With this dough, the autolyse helps it be more stretchy, I think. Also, I’m not the world’s best at shaping a very tight batard, and maybe that works in my favor here. Please try the fendu and tell me how it goes. I have noticed that in general a lower proportion of preferment (sourdough or other) gives me a crisper crust. I don’t know the theory behind that, but I’m sure there is one. Can someone enlighten us? Hi Susan! OH MY GAWD! Just when I thought it was safe to go back in the kitchen! 😉 The fendu is knockout gorgeous! I am always so jealous of your crumb, too! 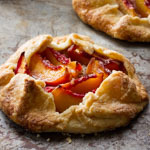 Your instructions and recipe is so easy to follow and the piccys are great! I’m overwhelmed. This is fantastic bread! Wonderful pictures to follow this shaping! Susan, you’re not provoking the angst, you are rather assuaging it. I’m just recollecting a fendu thread at tfl where it seemed like a major challenge to keep the sides from gluing back shut, people were scratching their heads very hard and as I recall dumping lots of flour on the hinge. Great photos. I can’t tell you how useful your site has been – especially right now as I am just starting my adventure with wild yeast. Beautiful! Fendu is one shape i’ve not tried yet, but with a tutorial this thorough, i’ll have to give it a shot! I have to say, I’m big fan of your idea to leave the door cracked for the last few minutes of baking. Last night i made some serrano/cheddar levain baguettes, tried it, and got a much improved crust. I usually end up with a thick, really chewy and kinda crunchy crust, but their crust was crisp and crunchy as crunchy could be. BZ & MyKitchenInHalfCups, I’m glad you like the photos. The shape really is quite easy and I was hoping the pictures would show that. Browndog, I kind of remember that thread. I’m wondering if maybe the problem was the dough being too wet, which might cause the shape to lose definition during proofing. Elizabeth, that was my first post to Just Baking. I’m happy you have found my blog helpful — that’s what I was aiming for! Ben, serrano/cheddar baguettes sound intriguing! Beautiful work, as always, Susan. I must try this one! Susan: I found your fantastic blog through The Freshloaf. 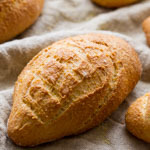 What beautiful breads you make! And thanks for including all of us on your bread baking adventures. 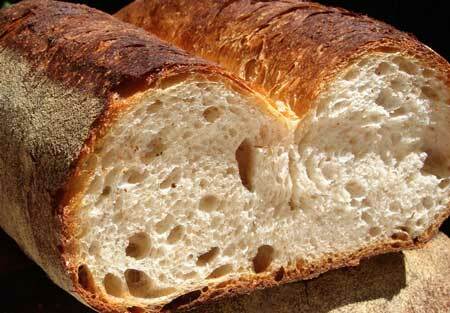 How do you like Giusto’s Golden Haven organic flour? I’ve been ordering Giusto’s Organic Baker’s Choice through my local health food store, but I understand that Golden Haven has malt added. Do you like it? Hi Liz, I’m glad you like the blog! This was my first time using the Golden Haven, but so far so good. Yes, it is malted. Malted organic flours are hard to find. I ordered this through a local natural foods store. Annie, I’m so happy to hear about your fendu! 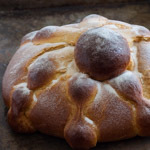 Yeast and salt are not added to an autolyse (nor is a preferment, unless it is a liquid one and needed for its water content, as here) because they would work against developing the extensibility that is the purpose of this step. Thank you for keeping me posted about your experience with the fendu, Annie. I’m so glad you’ve been making it and having good results. 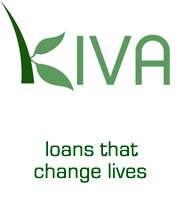 I love success stories! You always use such a lovely range of flours. Where do you procure most of yours? Do you mail order or buy them locally? Thanks for this formula. Made it this week, and it came out wonderful! While my shaping is still a work in progress, the crust, crumb and flavor are terrific. Next time I may do an overnight poolish. But love that one can get a loaf of this quality in one day. 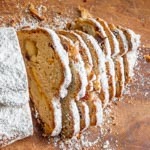 Schon als ich das Brot bei Susan gesehen habe, hat es mich an die Luzernwegge erinnert, und als dann auch noch Cascabel es nachgebacken hat, musste ich es auch ausprobieren.